Graduate in Catalan Philology from the University of Barcelona (UB) with a master’s degree in Advanced Studies in Catalan Language, Literature and Culture from Rovira i Virgili University (URV). Since 2010, he has coordinated the non-university area of the Institute of Education Sciences (ICE) at Rovira i Virgili University and held the position of academic director of the postgraduate degree in Management and Administration of Education Centres at the same university. Professor of upper secondary education since 1981, he was also director of the Institut Pons d'Icart in Tarragona (1985-1987). He has also taught on various postgraduate courses. In recent years, he has focused on lifelong learning for teaching staff, as a manager of training plans and a trainer in competency models, social media, and new technologies, at the Institute of Education Sciences at Rovira i Virgili University and in collaboration with the Educational Services and Pedagogical Resource Centres in the provinces of Tarragona and Les Terres de l'Ebre. 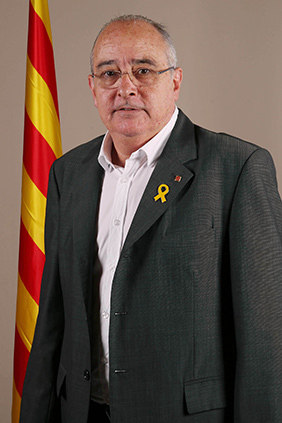 He was a member of the Parliament of Catalonia from 1992 until 2003. During this period, he was deputy spokesperson for the parliamentary group of ERC. He was also Head Minister for the Government of Catalonia from 2005 to 2006 and Minister for Education from 2003 to 2004. He then went on to direct the Ramon Llull Institute from 2006 to 2010. He was first deputy mayor for Torredembarra Town Council (1999-2003) and, during the second half of 2003, vice-president of Tarragonès Provincial Council. He has been a member of Esquerra Republicana since 1995. He founded the Catalan Assembly of Torredembarra, which he represented in the national plenary sessions. He was active in the PSUC, the PSAN and Nacionalistes d'Esquerra. He has published numerous essays and studies on literary criticism, history and theory, and various historical studies of popular culture, with a focus on festivals and the tradition of human towers. Author of Manual de mètrica i versificació catalanes (Manual of Catalan metre and verse) (1991, second augmented edition of 2007), he has also worked on commentary of literary texts and editing classics and has contributed as a literary critic to newspapers and specialised journals. He most recent work is Les set vides de Pere Romeu. Indians, modernistes i sportsmen (The seven lives of Pere Romeu. Indians, modernistas and sportsmen) (2016), about the figure of Ramon Casas’ companion in his well-known modernist painting of a tandem bicycle. Member of the Nois de la Torre human towers group, the Ball de Diables de Torredembarra group, and the group of La Virgília dragon carriers of Torredembarra, he created the project to redesign the Tarragona human towers competition in 2010. He is a patron of the Fundació Estela per a la Discapacitat and vice-president of Fundació Josep Irla.